Today I worked on the floor.. or should I say sub-floor. I put down a layer of insulation and then a layer of OSB board as the subfloor. Below is a picture of when I cut the three pieces of foam insulation to put beneath the subfloor. See the back, middle and front of the van floor? You can see the two wheel wells and also the fuel filler cutout on the left side.﻿ The notch out of the right front is for the step up from the side door. There was a rubber mat in the cargo area of the van. I used it for a cutting template for the insulation and OSB flooring. The mat had sound deadening insulation on it. In retrospect, I should have kept that insulation intact. Instead, I tore it from the back. It did come in handy under my knees when working in the van. In retrospect, I should have just laid my subfloor right over that mat… LOL. One caution about﻿ using the rubber mat… It has extra pieces of rubber here and there to fit into crevices, etc. 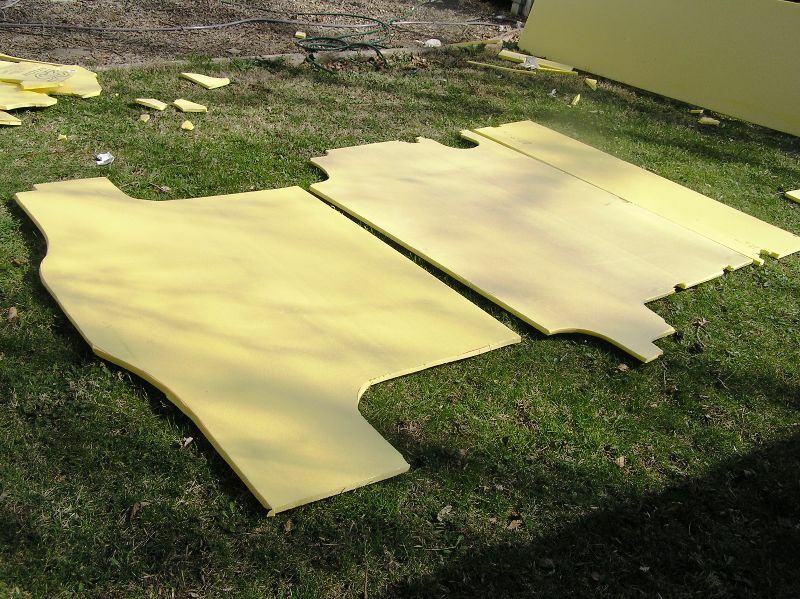 When you cut out an exact replica, you end up with too much board… You’ll get a feel for it though. All in all, I am happy how the floor came out. I do want to secure it with a FEW self tapping screws… I’m not happy about drilling holes but a few won’t hurt (much). By all means, do save the rubber mat. You can hide sins with it! In the back area, I plan to use mat pieces that I have cut and glued to finish off the transition from the flooring to the cargo area. Also, on the side door step up area, I plan to use a piece of mat to extend from the flooring to the step area. How am I going to pull that off? I’m thinking a little piece of metal for nailing will look pretty and hold a piece of rubber in place (which I will also glue) to make the step area blend into the flooring. See? Pieces of the salvaged rubber mat can hide a few sins!